I recently received the book Lashon Hakodesh: History, Holiness & Hebrew by Rabbi Reuven Chaim Klein. I honestly wasn't sure what to think of the book at first. The author and I come from very different worlds - or at least very different world views (we actually both come from California and now live in Israel). Klein has a strong yeshiva background, whereas while I learned in a yeshiva (and in fact learned much more there about Hebrew than I did in university), my approach is much more "academic" (a term he uses frequently throughout the book). But Klein does show respect and openness to the academic approach, even when he doesn't agree with it (and that's a path I try to follow as well). Another difference between us is that he prefers to reconcile different approaches, whereas I like to accentuate them. But there’s certainly a tradition in that going back to the Talmud (see for example Steinsaltz's Reference Guide to the Talmud, where he writes (page 6) that "in seeking to understand the words of the Mishnah or of the Amoraim one should always seek elements that reconcile the parties to the dispute and not those that divide them. Many of the most searching and significant questions and discussions in the Talmud derive from the desire to resolve differences.) Klein also did a tremendous amount of research, with extensive footnotes to allow the reader to continue investigating on their own. So in general, I found the book a pleasant and interesting read. The first four chapters deal with the Jewish (Rabbinic) view of the history of the Hebrew language (Klein consistently refers to the language described in the book as Lashon Hakodesh, partially as a polemic device to distinguish it from Modern Hebrew / Ivrit. While I understand his choice, I still prefer to use "Hebrew".) He discusses the language spoken by Adam after Creation, how the languages were split up at Migdal Bavel, what language Avraham spoke both before and after his migration to Canaan, and what the Jews spoke in Egypt. I found those chapters interesting on a personal level (particularly for my ongoing Avraham project), even though they’re not as relevant to what I write about on this site. Chapter five deals with the change of speech from Biblical Hebrew to Mishnaic Hebrew, Aramaic and Greek. Page 115 deals with borrowing words from other languages, which is much more relevant to Balashon. The second half of the chapter deals with Jewish languages in exile – lots of interesting material that I didn't know previously. On page 136 of that chapter, he claims that the meanings of some older words were changed in Modern Hebrew with the intent to make them more secular and remove the historic religious sense. This is strange to me, for I have not heard that claim before. I'll need to investigate the examples word for word, and I will try to address them on future posts here. A few I've already discussed – tarbut, bilui, achuz, and reviewing what I wrote there, I don't find evidence of the "ideological secularization of Hebrew terms" that Klein describes. He continues in chapter six, and quotes the Satmar Rebbe (page 142) as saying that Ben Yehuda died on Shabbat night with a pen in his hand. Klein says that whether or not it’s literally true is irrelevant, Ben Yehuda died an unrepentant sinner. But if he’s already talking about legends, there are other stories as well that emphasize that in response to Rav Kook's prodding, Ben Yehuda repented before his death. I don't find either set of stories particularly moving or significant (and in fact, I believe that Ben Yehuda's legacy should be viewed as secure from a religious standpoint as well, considering how much easier he made it for all Jews in Israel to study traditional texts), but I think more balance would have been appropriate here. Chapter seven – like chapter five – also deals with foreign influences on Hebrew. I've written about two of the terms he mentions: gematria and afikoman (the ones I haven't written about might serve as future posts here).The actual etymologies are less relevant – even folk etymologies are interesting, for they show how people viewed languages. (We see the same biases with non-rabbinic scholars such as Jastrow, Kohut, etc). He brings examples of rabbis who claim that there are not really foreign words in the Bible, or all words derive from Hebrew, Again, you don't need to accept the approach to find something interesting in seeing how the issue was viewed over time. The book ends with sections dealing with the religious status of Aramaic and the rabbinic views of the Ktav Ashuri and Ktav Ivri scripts (I personally enjoyed his quote on page 192 of the Rambam's commentary on Mishna Yadayim 4:5, who says that it was called Ashuri (fortunate) because each letter is distinct from each other, unlike the cursive languages where each letter runs into each other, causing confusion. Klein doesn't mention it, but I assume the Rambam was referring to Arabic, and I definitely find myself confused with aspect of the Arabic script). Judging a book by its cover, I can say that I found the cover design very attractive, and the book's overall layout and typesetting rather pleasing. While the book include a detailed biographical index, I would have appreciated a more traditional index of topics with page numbers. A book of this nature, in English, is long overdue for the traditional Orthodox reader. I hope it inspires more interest in the history of the Hebrew language. Bernard asked me about the etymology of the Hebrew word for decision - החלטה hachlata. This is actually kind of tricky. The JPS translates this as: "The men divined his meaning and quickly caught the word from him [ויחלטו]". They translate the root חלט here (in the kal form - vayachletu, unlike the hifil form we use in modern Hebrew) as "caught". This fits the Aramaic translations of the verse, who use the verb חטף - "to seize". Kaddari suggest that perhaps the verb means "to accept as certain". Daat Mikra on the verse quotes Rashi, who says that they wanted to make what the king said permanent, so they "cut off his words", so he could not change his mind. Rashi's word for permanent is tzmitut צמיתות, which he derives from Vayikra 25:23. There Onkelos translates לצמיתות latzmitut as לחלוטין lachalutin. and Ibn Ezra says the that the root צמת also means "to cut off" (as also found in Tehilim 94:23). So if we accept this meaning of the root, then there is a similar development to the English words "decide" and "decision", which also come from a root meaning "to cut off" (found also in such words as excise, circumcise, and incision). In post-biblical Hebrew we see the root חלט used more frequently, meaning "to decide", but also "determined", or "absolute", as in the expression lechalutin or the synonymous phrase from the same root - muchlat מוחלט. In Modern Hebrew we also have the expression be'hechlet בהחלט - "certainly, without doubt". An unrelated root also spelled חלט means "to mix, knead with hot water." In the Talmud we find this verb used to describe mixing boiling water with flour to make dough, or mixing food with vinegar to preserve it. Today it the word is primarily used to describe making tea - chalita חליטה is a tea infusion. Sarah asked if there's a connection between the word am עם - nation, and the root עמם, as found in the word amum עמום, meaning "dim" or "dark". So we can see from Klein's etymology of the two words that they each come from a different "ayin". Regarding the root עמם meaning dark or dim, Klein writes that it is cognate with the Arabic ghamma, meaning "he covered, veiled, concealed." As far as am, Klein says it comes from a distinct root עמם, meaning "to join, connect", and is cognate with the Arabic verb 'amma. Am meant "those united" or "those related". A related word is im עם - meaning "together with". This time I got a question about a word that I wasn't really that familiar with. A reader asked about the etymology of the word sechus סחוס - "cartilage", and correctly pointed out that this is not a biblical word (and was curious what the biblical word was). This word arose through a misreading of חסחוס as הסחוס, whose ה was mistaken for the article and was consequently dropped. For a similar misreading see דות. Before we get to chas'chus חסחוס, let's look at the misreading he mentions. In this case, the word chas'chus was read as has'chus, meaning "the sechus". The second example he gives, dut דות - "pit, cistern", was a misreading of the word chadut חדות as hadut הדות. A slightly different example that Klein doesn't mention, but might be more familiar to us, is the misreading of the word for sunrise, הנץ hanetz (a verb meaning he - the sun - shone) as "the netz", and therefore saying things like a "netz minyan" (with 690 hits on Google, compared to 20 for "hanetz minyan"). Now to chas'chus itself. Klein doesn't really give an etymology, but just says that it has related words in Aramaic, Syriac and Akkadian (hasisu), and that it should be compared to chasa חסה - the Hebrew word for lettuce, deriving from the Aramaic חסא - for which he says the etymology is unknown. He gives no clue as to why words for cartilage and lettuce would be connected, but Jastrow says that chas'chus might derive from the root חוס meaning "protection", and as I mentioned in the comments on this post, the leaves of the lettuce surround the core in a somewhat protective way. So maybe, but otherwise your guess is as good as mine. This book points out that other Akkadian words for body parts have a similar feature of reduplication, and some of the examples he gives have Hebrew cognates. So the Akkadian word for skull, gulgullatu, is cognate to the Hebrew gulgolet גלגולת, and the Akkadian word for "head", qadqadu, matches the Hebrew kodkod קודקוד. from French couscous (16c. ), ultimately from Arabic kuskus, from kaskasa "to pound, he pounded." Today one of Israel's politicians began his election campaign using the word tachlis תכל'ס. Let's take a look at the history and meaning of the word. Yiddish took the word tachlit and ended up with a different pronunciation than used in Sephardic and later modern Hebrew. The accent moved from the second to first syllable, and the dagesh-less tav was pronounced as "s" instead of "t". In Yiddish, the word might have still been spelled the same as in Hebrew, but in Modern Hebrew slang it took on its own identity by having a samech replace the final tav. The meaning also changed. From the sense of "purpose" or "aim" in Hebrew, the Yiddish form tachlis started to mean "the main point" - and then took on the meaning "practical details", "bottom line", or "brass tacks". It even can have a more general sense of "true" or "actually". So you might say in a business meeting, "Let's talk tachlis", or if after trying to figure out what restaurant to go to, you might confess that, "Tachlis, I'm not that hungry." More recently, I've heard it used on it's own, as an expression of agreement (similar to the English "true that" or "right on!"). If one person said at a party, "It's pretty boring here" another might respond, "Tachlis". While the word is slang in modern Hebrew (and there isn't even full agreement as to whether there's an apostrophe before the samech or not), it is rather ubiquitous in spoken Hebrew. The word tachlit is still used (something multipurpose is רב-תכליתי rav-tachliti), but many Israelis - particularly those who've never heard Hebrew spoken with the Ashkenazic pronunciation - are actually surprised to hear that tachlis derives from tachlit. Other slang words that have gone through the Hebrew -> Yiddish -> Hebrew conversion, like chevra חבר'ה - "group of friends" and maiseh מ'עישה "story" - would be easier for Israelis to trace back, because the spelling has been more closely maintained. Did I get to the tachlit of this post? Tachlis, I guess I did. Today I was asked about the word beshert (often spelled bashert). Let's take a look. The term beshert found deeper resonance after the 18th century, when romantic love and compatibility began to replace marriages arranged on the basis of money and social standing. So if the parents or matchmakers weren't setting up the marriage - then perhaps it became more clear that God was. What is the origin of the word? There are two primary theories. One says it comes from the German bescheren - "to give, to bestow - usually as a gift" (which has the third-person singular simple present beschert, past tense bescherte, past participle beschert). This root is cognate with the English word "share". "Beschert" is often used to mean Christmas and New Year presents, which according to folklore are divine gifts, hence the connection to beshert. On the other hand, in Fields of Offerings: Studies in Honor of Raphael Patai, Robert Gordis thinks that the origin from the sense of "shear" is more likely. He quotes Isaiah 38:12 and Job 7:6 as using the theme of "the thread of life", and from Greek mythology through Milton and Shakespeare we find examples of fate cutting that thread. Gordis writes, "that it is within this conceptual framework that the etymology of bashert is to be sought." In favor of relating the Yiddish bashert to "shear, cut off," rather than to "share," are several considerations. (1) The meaning "share" does not occur in Yiddish, while the verb sheren, "cut, clip," does. (2) The Modern German root bescheren is used in a favorable sense, "give as a share or present." On the other hand, the Yiddish bashert generally carries a negative connotation, "predestined to trouble, disaster or sorrow." (3) The theme of "determine, decide," as these very words indicate ("determine," make an end, de-cido, Latin "cut off") is generally expressed by the idea of cutting off. Hebrew offers a wealth of examples in every period of the language. For biblical Hebrew, we may note haratz, gazar, hatakh. The two latter roots continued to be used in rabbinic Hebrew. Most common of all is the root pasaq, "cut," from which is derived the basic term p'saq, "decision," frequent in rabbinic Hebrew and Yiddish (p'saq din). (4) The ubiquity of the figure of the shears of fate supports the view that the Yiddish locution means "determined, predestined, foreordained." The negative connotation is not absolute. The substantive basherte is used of one's (predestined) bride. I hesitate to suggest that this use carries an ironic nuance. I have a feeling that the romantics will probably prefer the alternate etymology. And in his Comprehensive Dictionary of the Hebrew Language, under lavi לביא (a term for an older lion), he says that it is also related to the Ugaritic lbu and Arabic labu'ah - all meaning "lion". However, Hebrew has more than one word for lion. Let's look at them. Perhaps the most familiar term (in Modern Hebrew at least) is ari ארי or aryeh אריה. Klein writes that ari is related to Ethiopian 'arwe (=wild beast), Akkadian aru (= eagle) and Arabic 'arwa ( = ibexes). A post on the forum here quotes the HALOT entry for ari, mentions some additional Semitic language with other cognates and animal terms, and writes that the word originally meant "wild animal." Klein also writes that the word ariel אריאל, which he defines as "hero" and appears only once in the Bible (Shmuel II 23:20), literally means "lion of God" (as does אראל erel - a term for an angel). Aryeh, Ari and Ariel are all common Hebrew names. The phenomenon of naming people after lions is very widespread as we'll continue to see. The German word for lion, löwe, is cognate with the English, and led to the Yiddish loeb or leib. In Yaakov's blessing to his son Yehuda, he compares him to a lion (Bereshit 49:9). So the names Yehuda, Aryeh and Leib became somewhat interchangeable. In fact, I've seen my great-great-grandfather on gravestones (of his children) mentioned as Yosef Yehuda, Yosef Aryeh and Yosef Leib. Other biblical names for lions are kfir כפיר and shachal שחל, which along with lavi, are popular Israeli first and last names. Perhaps they gained popularity because aryeh was viewed as old fashioned. Klein writes that kfir - a young lion - might derive from the root כפר, to cover (see this post), and is "properly denoting a lion already covered with a mane". Two other Hebrew terms for lion are layish ליש and shachatz שחץ, but I have not seen them used for names. (For more discussion of lions in the Bible and in Judaism, see this Encyclopedia Judaica article). Arabic uses lion terms for names as frequently as Hebrew does. 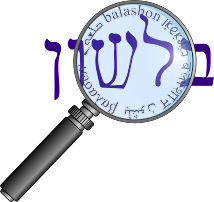 This article discusses the practice, and we'll look at a few examples that have Hebrew cognates. Meanwhile, the root of Osama/Usama is wasama, which is to brand or stamp (eg, cattle). By extension, wisaam is a mark of distinction or honor and wasaama is grace or beauty—both things that lions have, even if the late Mr bin Laden was sorely lacking in either. We looked at the same root in our discussion of the etymology of the word monsoon, where we saw that wasama is cognate with the Hebrew shem שם - "name". Arab 'abasa - 74:22 "Then he frowned and he scowled! ": Heb. 'abas: The primary sense is connected with 'contracting' and 'shriveling', with Arab. restricting the usage to the human face and Heb. applying the root to grains. He is referring to the Hebrew root עבש - to shrivel, to grow moldy. This is used in Modern Hebrew in the word עובש ovesh - "mold". So admiring lions seems to be one thing Arabs and Jews can agree on. Sadly, the Asiatic lion, formerly found in this region, went extinct at the time of the Crusades. Here are two Hebrew expressions that sound very similar, but have very different meanings. "Al Panav" על פניו - literally means "on it's face", and can be translated as "apparently". "Al Hapanim" על הפנים - literally means "on the face" and is a slang term meaning "the [situation/thing] is terrible." The origin of al panav is easier to determine. It comes from the English "on the face of it", which likely originates in the Latin prima facie (at first face). It's not an ideal Hebrew phrase, as there is an existing word in Hebrew with the same meaning - לכאורה lichora. However, as this site points out, if you really want a similar sounding phrase, then al pnei hadevarim על פני הדברים is closer to being correct. Al hapanim is a harder one to crack. According to the same article I quoted above, it doesn't appear in the older slang dictionaries. All I've seen so far are speculations, but they all seem reasonable. In Rosenthal's Dictionary of Hebrew Slang, he suggests it comes from the English "to fall flat on your face" (an expression which fully translated into Hebrew made it into Yehudit Ravitz's 2000 song געגוע - which contains the lyrics איך לא ידעתי לא ליפול על הפנים). Nissan Netzer in his Hebrew in Jeans - the Image of Hebrew Slang, says the origin might be from Yiddish, which also have expressions meaning "to fall on the face". This article (not sure who the author is) has a few more suggestions. They quote another Yiddish phrase meaning "his face fell", which is similar to the biblical נפלו פניו naflu panav (see Bereshit 4:6). They also mention that Yiddish, Russian and English all have phrases meaning "a slap in the face" - so perhaps one of them influenced the Hebrew.